As the Beaver just noted in a comment to The 47ers post, The Washington Post has published a guest editorial from Joshua Muravchik - a Fellow at Johns Hopkins University's School of Advanced Military Studies. Dr. Muravchik's argument is that war with Iran is the best option for dealing with their nuclear weapons program. One of the most important thing that those who develop policy and strategy need is an understanding of the human geography of the problem sets they are looking at in order to establish more fully informed objectives and develop the ways and means to achieve them. An understanding of the socio-cultural context that shows the interaction of people, places, and things (both natural and man made) is always illuminating when trying to explain this type of context in support of policy formation, strategic development, and planning. Using annotated maps is especially helpful. There are three maps that demonstrate why Dr. Muravchik's thesis is not the best option. All three maps where found with the following simple keyword searches using Google Image search: Iranian nuclear sites, Iranian military sites map, and Iranian population centers map. We are not talking or typing rocket science here. So what does this all have to do with Dr. Muravchik's thesis that going to war with Iran is our best option? If you compare the three maps you notice some important features. First, a significant number of Iran's nuclear sites, military sites, and population centers are all located in proximity to each other. This is not, in itself, surprising. The same natural and man made infrastructure necessary for a municipality is also necessary for military sites, and especially so for research and development sites. The ability to get personnel and supplies where they need to be in a timely manner means taking advantage of already existing infrastructure. However, access to infrastructure for logistics' purposes is not the only reason for some of this co-location. For instance, the nuclear facility near Qom is not an accident. It was placed there in order to make it difficult for a US commander to approve a strike on it. Collateral damage from a strike that damages Qom is going to enrage Shi'a everywhere and reinforce support for the Iranian government. And this is where we really get to what the three maps are telling us. When you compare the locations of the nuclear sites, the military sites, and the population centers it becomes clear that an attempt to militarily reduce Iran's nuclear facilities, let alone degrade their military facilities, essentially amounts to reducing Iran. The potential for radioactive fallout from the destruction of Iran's nuclear facilities, combined with other forms of collateral damage, would likely create a humanitarian crisis of almost unprecedented proportions. The only state with the strategic capabilities to provide the necessary humanitarian relief is the US - no one else has our strategic lift and response capabilities. Basically, a successful reduction of Iran's nuclear facilities and capabilities will create a humanitarian crisis that only the US can successfully respond to. A response that would have to be amongst a population that is suffering because of the humanitarian crisis that the US just created. And all of this for what most agree would be a modest setback for Iran in developing a nuclear weapon. Even Dr. Muravchik recognizes this, which is why he brushes it off by asserting we can just attack again and again if need be. This does not even include the consideration that Iranians would rally around their government or what forms of overt and covert responses Iran would take. As a result, Dr. Muravchik's recommendation fails the questions of feasibility, acceptability, and suitability. Attacking Iran to destroy their nuclear sites is not feasible - it would not set back any program for a significant amount of time; would rally support for the Iranian government amongst the Iranian population; would create an almost unprecedented and unseen humanitarian crisis; and would lead to significant overt and covert reprisals. It is also not acceptable. While the initial coverage of the air strikes on cable and broadcast news would likely play in Peoria, once the reality sinks in; the reprisals start; US civilian and military personnel are put at risk in the aftermath of the attacks; and the costs to the American and global economies kick in; whatever popular support such a course of action might have will fall off dramatically. Moreover, it will certainly not be acceptable among our allies - it might play in Peoria, but it won't play in London, Paris, or Berlin. There will certainly be no UN Security Council Resolution providing legitimacy. Finally, it is not suitable. Whatever good will the US has as a global force for good, will be quickly lost if we unilaterally strike at Iran's nuclear facilities. What Dr. Muravchik has proposed will not actually achieve any of America's goals in regard to Iran and the Middle East. It will not significantly set back Iran's nuclear program. It is unlikely to actually lead to a change in Iranian government. It would actually further destabilize the Levant and increase the risk to the US and our allies. What Dr. Muravchik is really proposing is war for war's sake, which should never be an option. 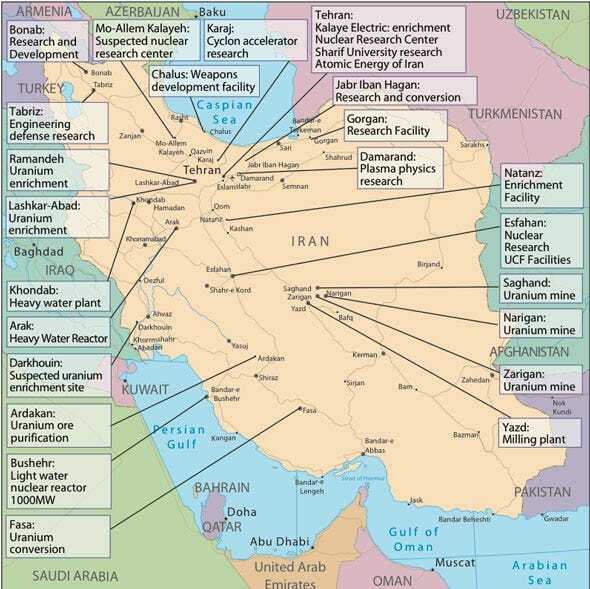 * The map of Iran's nuclear sites was found at Business Insider. ** The map of Iran's military sites as of 2002 was found at Wikipedia. *** The map of Iran's population center's and densities was found at the BBC.